A mixture of fish oil and primrose oil; used as a high-docosahexaenoic acid fatty acid supplement. Synthesis , By Farmer, Ernest H.; Van den Heuvel, Frantz A., From Journal of the Chemical Society (1938), 427-30. Literature References: Omega-3 fatty acid found in marine fish oils and in many phospholipids. Major structural component of excitable membranes of the retina and brain; synthesized in the liver from a-linolenic acid, q.v. Isoln from oil of Sardina ocellata J. and structure: J. M. Whitcutt, Biochem. J. 67, 60 (1957). Improved isoln from cod liver oil: S. W. Wright et al., J. Org. Chem. 52,4399 (1987). Effect on brain and behavioral development: P. E. Wainwright, Neurosci. Biobehav. Rev. 16, 193 (1992). Review of uptake and metabolism by retinal cells: N. G. Bazan, E. B. Rodriguez de Turco, J. Ocul. Pharmacol. 10, 591-603 (1994). Review of clinical studies in infant formula supplementation: M. Makrides et al., Lipids 31, 115-119 (1996). Properties: Clear, faintly yellow oil, mp -44.7 to -44.5°. n26D 1.5017. Docosahexaenoic acid (DHA) is an omega-3 fatty acid that is a primary structural component of the human brain, cerebral cortex, skin, and retina. It can be synthesized from alpha-linolenic acid or obtained directly from maternal milk (breast milk), fish oil, or algae oil. DHA’s structure is a carboxylic acid (-oic acid) with a 22-carbon chain (docosa- derives from the Ancient Greek for 22) and six (hexa-) cis double bonds (-en-); with the first double bond located at the third carbon from the omega end. 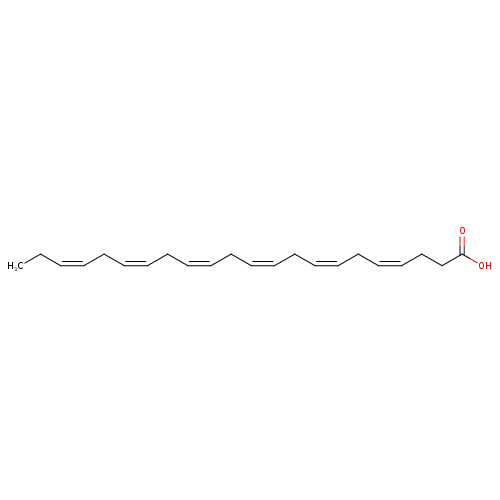 Its trivial name is cervonic acid, its systematic name is all-cis-docosa-4,7,10,13,16,19-hexa-enoic acid, and its shorthand name is 22:6(n−3) in the nomenclature of fatty acids. Most of the DHA in fish and multi-cellular organisms with access to cold-water oceanic foods originates from photosynthetic and heterotrophic microalgae, and becomes increasingly concentrated in organisms the further they are up the food chain. DHA is also commercially manufactured from microalgae: Crypthecodinium cohnii and another of the genus Schizochytrium. DHA manufactured using microalgae is vegetarian. In strict herbivores, DHA is manufactured internally from α-linolenic acid, a shorter omega-3 fatty acid manufactured by plants (and also occurring in animal products as obtained from plants), while omnivores and carnivores primarily obtain DHA from their diet. Limited amounts of eicosapentaenoic and docosapentaenoic acids are possible products of α-linolenic acid metabolism in young women and men. DHA in breast milk is important for the developing infant. Rates of DHA production in women are 15% higher than in men. DHA is a major fatty acid in brain phospholipids and the retina. While the potential roles of DHA in the mechanisms of Alzheimer’s disease are under active research, studies of fish oil supplements, which contain DHA, have failed to support claims of preventing cardiovascular diseases. DHA is the most abundant omega-3 fatty acid in the brain and retina. DHA comprises 40% of the polyunsaturated fatty acids (PUFAs) in the brain and 60% of the PUFAs in the retina. Fifty percent of the weight of a neuron‘s plasma membraneis composed of DHA. DHA modulates the carrier-mediated transport of choline, glycine, and taurine, the function of delayed rectifier potassium channels, and the response of rhodopsin contained in the synaptic vesicles, among many other functions. DHA deficiency is associated with cognitive decline. Phosphatidylserine (PS) controls apoptosis, and low DHA levels lower neural cell PS and increase neural cell death. DHA levels are reduced in the brain tissue of severely depressed patients. 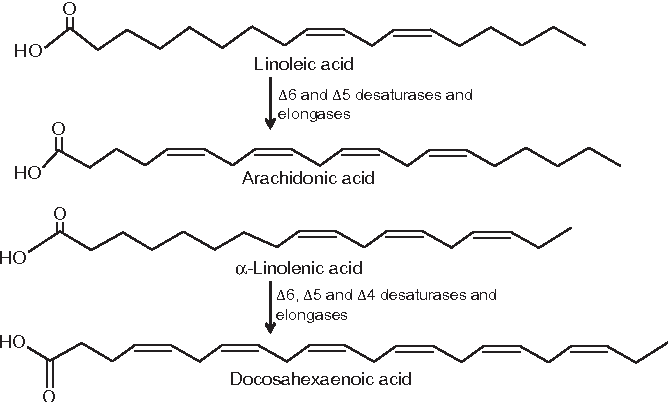 In humans, DHA is either obtained from the diet or may be converted in small amounts from eicosapentaenoic acid (EPA, 20:5, ω-3) via docosapentaenoic acid (DPA, 22:5 ω-3) as an intermediate. This synthesis had been thought to occur through an elongation step followed by the action of Δ4-desaturase. It is now considered more likely that DHA is biosynthesized via a C24 intermediate followed by beta oxidation in peroxisomes. Thus, EPA is twice elongated, yielding 24:5 ω-3, then desaturated to 24:6 ω-3, then shortened to DHA (22:6 ω-3) via beta oxidation. This pathway is known as Sprecher’s shunt. desaturation at the fourth carbon of docosapentaenoic acid by a Δ4 desaturase to produce DHA. DHA can be metabolized into DHA-derived specialized pro-resolving mediators (SPMs), DHA epoxides, electrophilic oxo-derivatives (EFOX) of DHA, neuroprostanes, ethanolamines, acylglycerols, docosahexaenoyl amides of amino acids or neurotransmitters, and branched DHA esters of hydroxy fatty acids, among others. The enzyme CYP2C9 metabolizes DHA to epoxydocosapentaenoic acids (EDPs; primarily 19,20-epoxy-eicosapentaenoic acid isomers [i.e. 10,11-EDPs]). While one human trial of 402 subjects lasting 18 months concluded that DHA did not slow decline of mental function in elderly people with mild to moderate Alzheimer’s disease, a similar trial of 485 subjects lasting 6 months concluded that algal DHA of 900 mg per day taken decreased heart rate and improved memory and learning in healthy, older adults with mild memory complaints. In another early-stage study, higher DHA levels in middle-aged adults was related to better performance on tests of nonverbal reasoning and mental flexibility, working memory, and vocabulary. One study found that the use of DHA-rich fish oil capsules did not reduce postpartum depression in mothers or improve cognitive and language development in their offspring during early childhood. Another systematic review found that DHA had no significant benefits in improving visual field in individuals with retinitis pigmentosa. A 2017 pilot study found that fish oil supplementation reduced the depression symptoms emphasizing the importance of the target DHA levels. It has been recommended to eat foods which are high in omega-3 fatty acids for women who want to become pregnant or when nursing. A working group from the International Society for the Study of Fatty Acids and Lipids recommended 300 mg/day of DHA for pregnant and lactating women, whereas the average consumption was between 45 mg and 115 mg per day of the women in the study, similar to a Canadian study. Despite these recommendations, recent evidence from a trial of pregnant women randomized to receive supplementation with 800 mg/day of DHA versus placebo, showed that the supplement had no impact on the cognitive abilities of their children at up to seven years follow-up. In one preliminary study, men who took DHA supplements for 6–12 weeks had lower blood markers of inflammation. Ordinary types of cooked salmon contain 500–1500 mg DHA and 300–1000 mg EPA per 100 grams. Additional rich seafood sources of DHA include caviar (3400 mg per 100 grams), anchovies (1292 mg per 100 grams), mackerel (1195 mg per 100 grams), and cooked herring(1105 mg per 100 grams). Brains from mammals are also a good direct source, with beef brain, for example, containing approximately 855 mg of DHA per 100 grams in a serving. In the early 1980s, NASA sponsored scientific research on a plant-based food source that could generate oxygen and nutrition on long-duration space flights. Certain species of marine algae produced rich nutrients, leading to the development of an algae-based, vegetable-like oil that contains two polyunsaturated fatty acids, DHA and arachidonic acid, present in some health supplements. DHA is widely used as a food supplement. It was first used primarily in infant formulas. In 2004, the US Food and Drug Administration endorsed qualified health claims for DHA. Some manufactured DHA is a vegetarian product extracted from algae, and it competes on the market with fish oil that contains DHA and other omega-3s such as EPA. Both fish oil and DHA are odorless and tasteless after processing as a food additive. Vegetarian diets typically contain limited amounts of DHA, and vegan diets typically contain no DHA. In preliminary research, algae-based supplements increased DHA levels.While there is little evidence of adverse health or cognitive effects due to DHA deficiency in adult vegetarians or vegans, breast milk levels remain a concern for supplying adequate DHA to the developing fetus. Fish oil is widely sold in capsules containing a mixture of omega-3 fatty acids, including EPA and DHA. Oxidized fish oil in supplement capsules may contain lower levels of EPA and DHA. An abundance of DHA in seafood has been suggested as being helpful in the development of a large brain, though other researchers claim a terrestrial diet could also have provided the necessary DHA. The raw EPA ethyl ester 1 of Comparative Example 1 containing EPA 96.7%, except for changing the temperature of the alkaline hydrolysis in 6 ° C., in the same manner as in Comparative Example 1 was alkaline hydrolysis. That is, the starting EPA ethyl ester 1 2.50 g, ethanol 6.25 mL (4.92 g, 14.11 equivalents relative fatty acid), water 1.00 mL, 48 wt% sodium hydroxide aqueous solution 0.76 g ( 1.20 equivalents of base) was added a sample solution 3 was prepared against fatty acids. In sample liquid 3, moisture 1.40 g, i.e., was 10.27 equivalents relative fatty acid. The sample liquid 3, stirred for 24 hours 6 ° C., was subjected to hydrolysis treatment. Confirmed the completion of the reaction of the hydrolysis treatment, returned to the sample liquid 3 after treatment at room temperature, after transferred to a separatory funnel, and hexane was added 3.13 mL, purified water 2.50mL the sample liquid 3. When further adding 2.25g of hydrochloric acid, the sample solution 3 was separated into two layers of hexane and aqueous layers. The pH of the aqueous layer was 1.0. The sample liquid 3 was stirred, then the mixture was allowed to stand, after removing the aqueous layer from the sample liquid 3, was further stirred with purified water 3.75mL the sample liquid 3 after removal. Hydrochloric acid was added small amount to adjust the pH of the aqueous layer to 1.0. Thereafter, the aluminum plate was washed with the same amount of purified water as rinsing liquid. Rinsing liquid is recovered after washing with water was repeatedly washed with water until neutral pH 6.0 ~ 7.0. The hexane layer was recovered from the sample liquid 3 after washing with water, the recovered hexane layer, the hexane was removed with an evaporator and vacuum, the EPA3 a composition containing free EPA was obtained 2.14 g.
Against EPA3, it was evaluated in the same manner as EPA1. The results are shown in Table 1 and Table 4. The recovery was 93.8%. The resulting Gardner color of EPA3 is 2-, AnV 1.3, ethyl ester (EE) content 2790Ppm, conjugated diene acid content was 0.47%. Conjugated unsaturated fatty acids other than the conjugated diene acid was not detected. These physical property values are shown in Table 1. Note that the conjugated unsaturated fatty acids, only the conjugated diene acid shown in Table 1. Process for production of docosahexaenoic acid (DHA), by microbial fermentation of Schizochytrium limacinum . Discloses use of DHA for treating cardiovascular diseases, infertility or neurological diseases. See CN106635405 , claiming method for separating DHA from powder DHA grease by supercritical extraction method. Kingdomway lists that it produces DHA by microorganism fermentation. DHA, the full name doc-4,7,10,13,16,19-docosahexaenoic acid, DHA, is a polyunsaturated fatty acid. The human body is difficult to synthesize itself and must be taken from the outside world. DHA is one of the essential fatty acids in the human body. It has important physiological regulation functions and health care functions. When it is lacking, it will cause a series of diseases, including growth retardation, skin abnormalities, scales, infertility, mental retardation, etc. In addition, there are cardiovascular diseases. Special preventive and therapeutic effects. Studies have also shown that DHA can act on many different types of tissues and cells, inhibit inflammation and immune function, including reducing the production of inflammatory factors, inhibit lymphocyte proliferation, etc. DHA also has multiple effects in preventing Alzheimer’s disease and neurological diseases. . The current commercial sources of DHA are mainly fish oil and microalgae. DHA extracted from traditional deep-sea fish oil is unstable due to the variety, season and geographical location of fish, and the content of cholesterol and other unsaturated fatty acids is high. The difference in length and degree of unsaturation of fatty acid chains is large, resulting in limited production and content of DHA. It is not high, it is difficult to separate and purify, and the cost is high. With the growing shortage of fish oil raw materials, it is difficult to achieve the widespread use of DHA, a high value-added product in the food and pharmaceutical industries. The production of DHA by microbial fermentation can overcome the defects of traditional fish oil extraction, can be used for mass production of DHA, continuously meet people’s needs, has broad application prospects, and has attracted the attention of scholars at home and abroad. The microbial fermentation method uses fermented microorganisms such as fungi and microalgae to produce DHA-containing algal oil, and refined to obtain essential oil with high DHA content. DHA-producing strains approved by the Ministry of Health include Schizochytrium sp., Ulkenia amoeboida, and Crypthecodinium cohnii. The market share of DHA produced by microbial fermentation is increasing rapidly year by year. There is a trend to replace DHA of fish oil, improve the production technology and quality of microalgae DHA, and the prospect of entering the microalgae DHA market is broad. The publication No. 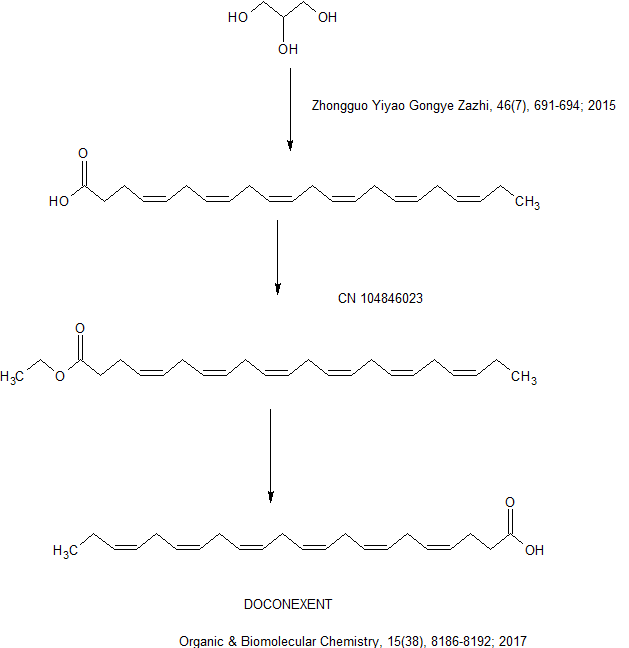 CN103882072A discloses a method for producing docosahexaenoic acid by using Schizochytrium, and the highest yield disclosed is a cell dry weight of 61.2 g/L, a DHA content of 55.07%, and a DHA yield of 22.17 g. /L. The publication No. CN101812484A discloses a method for fermenting DHA by high-density culture of Schizochytrium, which discloses a dry cell weight of 120-150 g/L and a DHA yield of 26-30 g/L, which is also reported. The highest production level of DHA produced by Schizochytrium sp. Although the DHA productivity has been greatly improved compared with the previous research, the industrial production of docosahexaenoic acid by using microalgae greatly reduces the production cost, increases the unit yield, and enables the method of microbial fermentation to produce DHA. Promotion and popularization are still far from enough. There are three main methods for extracting DHA from the fermentation liquid of Schizochytrium, one is centrifugation, the other is organic solvent extraction, and the third is supercritical extraction. Centrifugation, such as the publication No. CN101817738B, discloses a method for extracting DHA from algae and fungal cells by separating the microalgae or fungal fermentation broth after fermentation by a separation system, and adjusting the pH of the sludge with an acid. 2.0-4.0, then control the temperature of the slime at 10 °C-20 °C, add anti-oxidant in the slime, and then carry out high-pressure homogenization and breaking through the high-pressure homogenizer; add the broken mud to the water, stir and feed The liquid was separated by a three-phase separator to obtain DHA grease. The invention adopts physical wall breaking and physical extraction methods, has simple process, high cell breakage, low temperature treatment of bacteria sludge and antioxidant treatment, can effectively protect the biological activity of algae and fungal cells, and the product is green and non-toxic. Residue. However, the quality of the oil layer after centrifugation of the invention is poor. In addition to the oil, it also contains impurities such as water, medium components and cell debris, which is not conducive to subsequent refining. In addition, the wastewater layer after centrifugation contains a large amount of slag and has a high COD. Difficult to handle or process is extremely costly. The organic solvent extraction method, such as the publication No. CN101824363B, discloses a method for extracting docosahexaenoic acid oil: the fermentation liquid containing docosahexaenoic acid is subjected to enzymatic breaking, and then an organic solvent is used first. The first stage water is divided, the cells are enriched, and the organic solvent is used for secondary extraction to obtain a crude oil. The method is simple in operation and low in equipment investment, but the method uses organic solvent for extraction, and the final product may have solvent residue, and the extraction process has safety hazards such as flammability and explosion. The supercritical extraction method, as disclosed in the publication No. CN102181320B, discloses a method for extracting bio-fermented DHA algae oil, comprising the following steps: a) drying the solid matter obtained by solid-liquid separation of the microalgae fermentation liquid to obtain a dried bacterial cell; b) extracting the dried cells with supercritical carbon dioxide as an extractant to obtain a carbon dioxide fluid; c) separating the carbon dioxide fluid under reduced pressure to obtain DHA algae oil. Experiments show that the DHA content of DHA algae oil obtained by the method provided by the invention is more than 40%, the extraction yield is only 85.23%, and the need to add ethanol as the extracting agent has certain safety risks and supercritical. The equipment is expensive and the extraction yield is not high. In the prior art, the refining of DHA hair oil is mostly carried out by chemical refining technology, and the DHA hair oil is degummed, alkali refining, decolorized and deodorized to obtain DHA essential oil. Inevitably, there are some problems in the process technology. For example, in order to achieve the requirement of controlling low acid value, alkali refining usually adds excessive alkali, and some triglycerides are inevitably saponified; high COD wastewater produced by alkali refining will pollute the environment; Alkali refining requires high temperature treatment for a long time, which is easy to cause the product’s peroxide value and anisidine value to increase; the deodorization temperature is high, and the long time is easy to produce trans fatty acids. Currently, there is still a need to develop new DHA production processes. In the following Examples 1-13, unless otherwise specified, the seed medium formulations used were: glucose 3%, peptone 1%, yeast powder 0.5%, sea crystal 2%, and pH natural (the rest being water). The fermentation medium formula is: glucose 12%, peptone 1%, yeast powder 0.5%, sea crystal 2% (the rest is water). The Schizochytrium sp. ATCC 20888, Schizochytrium limacinum Honda et Yokochi ATCCMYA-1381, and Schizochytrium sp. CGMCC No. 6843 slope-preserved strains were respectively inserted into 400 mL of medium. The 2L shake flask was cultured at a temperature of 25 ° C at a rotation speed of 200 rpm for 24 hours to complete the activated culture of the strain. According to the inoculation amount of 0.4%, the shake flask seed solution was connected to the first-stage seed tank containing the sterilized medium, and the culture temperature was 28 ° C, the aeration amount was 1 vvm, the tank pressure was 0.02 MPa, and the stirring speed was 50 rpm for 30 hours to complete the first stage. Seeds are expanded and cultured. The seed liquid of the primary seed tank was connected to the secondary seed tank containing the sterilized medium according to the inoculation amount of 3%, and the culture temperature was 28 ° C, the aeration amount was 1 vvm, the tank pressure was 0.02 MPa, and the stirring speed was 75 rpm for 24 hours. Complete secondary seed expansion culture. The seed solution of the secondary seed tank was connected to a fermentor containing the sterilized medium according to a 3% inoculum. The fermentation process has a culture temperature of 28 ° C, aeration of 1 vvm, a can pressure of 0.02 MPa, a stirring speed of 75 rpm, a carbon source containing 30% of the pretreated crude glycerin, a glucose concentration of 5 g/L, and a nitrogen source. Fermentation culture. During the fermentation process, the glucose concentration, pH, bacterial biomass, crude oil production and DHA yield of the fermentation broth were measured. After 96 hours of culture, the fermentation was terminated. Table 1 below shows the biomass, crude oil production, DHA production and DHA productivity of the three strains cultured in the original culture mode. Table 2 below shows the mixed fat and fatty acid composition of the gas obtained after fermentation. Analysis results. The biomass, crude oil production and DHA production of CGMCC No.6843 are also shown in Figure 3. It can be seen from Table 1 and Table 2 that the yield and fatty acid composition of the three strains are different in the original culture mode, and the Schizochytrium sp. CGMCC No. 6843 is superior to the other two strains. Schizochytrid sp. (Schizochytrium sp. CGMCC No. 6843) was used as the starting strain to optimize the different culture methods. Jump up^ Guesnet P, Alessandri JM (2011). “Docosahexaenoic acid (DHA) and the developing central nervous system (CNS) – Implications for dietary recommendations”. Biochimie. 93(1): 7–12. doi:10.1016/j.biochi.2010.05.005. PMID 20478353. Jump up^ “Archived copy”. Archived from the original on 2013-07-07. Retrieved 2012-04-21. Jump up^ The omega end is the one furthest from the carboxyl group. Jump up^ Martek Biosciences Corporation (5 April 2007). “History of Martek”. Archived from the original on February 5, 2007. Retrieved March 10, 2007. Jump up^ Martek Biosciences Corporation (29 July 2008). “Martek Products”. Archived from the original on June 12, 2008. Retrieved July 29, 2008. ^ Jump up to:a b c d Burdge, G. C.; Jones, A. E.; Wootton, S. A. (2002). “Eicosapentaenoic and docosapentaenoic acids are the principal products of α-linolenic acid metabolism in young men”. British Journal of Nutrition. 88 (4): 355–363. doi:10.1079/BJN2002662. PMID 12323085. ^ Jump up to:a b Burdge, G. C.; Wootton, S. A. (2002). “Conversion of alpha-linolenic acid to eicosapentaenoic, docosapentaenoic and docosahexaenoic acids in young women”. British Journal of Nutrition. 88 (4): 411–20. doi:10.1079/BJN2002689. PMID 12323090. Jump up^ Malone, J. Patrick (2012). “The Systems Theory of Autistogenesis: Putting the Pieces Together”. SAGE Open. 2 (2). doi:10.1177/2158244012444281. Jump up^ Giltay EJ, Gooren LJ, Toorians AW, Katan MB, Zock PL (2004). “Docosahexaenoic acid concentrations are higher in women than in men because of estrogenic effects”. The American Journal of Clinical Nutrition. 80 (5): 1167–74. PMID 15531662. Jump up^ Cederholm T, Salem N Jr, Palmblad J (2013). “ω-3 fatty acids in the prevention of cognitive decline in humans”. Adv Nutr. 4 (6): 672–6. doi:10.3945/an.113.004556. PMC 3823515  . PMID 24228198. Jump up^ Zimmer, Carl (September 17, 2015). “Inuit Study Adds Twist to Omega-3 Fatty Acids’ Health Story”. New York Times. Retrieved October 11, 2015. Jump up^ O’Connor, Anahad (March 30, 2015). “Fish Oil Claims Not Supported by Research”. New York Times. Retrieved October 11, 2015. Jump up^ Grey, Andrew; Bolland, Mark (March 2014). “Clinical Trial Evidence and Use of Fish Oil Supplements”. JAMA Internal Medicine. 174 (3): 460–462. doi:10.1001/jamainternmed.2013.12765. PMID 24352849. Retrieved October 11, 2015. Jump up^ Meharban Singh (March 2005). “Essential Fatty Acids, DHA and the Human Brain from the Indian Journal of Pediatrics, Volume 72” (PDF). Retrieved October 8, 2007. Jump up^ Arthur A. Spector (1999). “Essentiality of Fatty Acids from Lipids, Vol. 34”. doi:10.1007/BF02562220. Retrieved October 8, 2007. Jump up^ Lukiw WJ, Cui JG, Marcheselli VL, Bodker M, Botkjaer A, Gotlinger K, Serhan CN, Bazan NG (October 2005). “A role for docosahexaenoic acid-derived neuroprotectin D1 in neural cell survival and Alzheimer disease”. J Clin Invest. 115 (10): 2774–83. doi:10.1172/JCI25420. PMC 1199531  . PMID 16151530. Jump up^ Serhan CN, Gotlinger K, Hong S, Arita M (2004). “Resolvins, docosatrienes, and neuroprotectins, novel omega-3-derived mediators, and their aspirin-triggered endogenous epimers: an overview of their protective roles in catabasis”. Prostaglandins Other Lipid Mediat. 73 (3–4): 155–72. doi:10.1016/j.prostaglandins.2004.03.005. PMID 15290791. Jump up^ McNamara RK, Hahn CG, Jandacek R, et al. (2007). “Selective deficits in the omega-3 fatty acid docosahexaenoic acid in the postmortem orbitofrontal cortex of patients with major depressive disorder”. Biol. Psychiatry. 62 (1): 17–24. doi:10.1016/j.biopsych.2006.08.026. PMID 17188654. Jump up^ McNamara, R. K.; Jandacek, R; Tso, P; Dwivedi, Y; Ren, X; Pandey, G. N. (2013). “Lower docosahexaenoic acid concentrations in the postmortem prefrontal cortex of adult depressed suicide victims compared with controls without cardiovascular disease”. Journal of Psychiatric Research. 47 (9): 1187–91. doi:10.1016/j.jpsychires.2013.05.007. PMC 3710518  . PMID 23759469. Jump up^ De Caterina, R; Basta, G (June 2001). “n-3 Fatty acids and the inflammatory response – biological background”. European Heart Journal Supplements. 3 (Supplement D): D42–D49. doi:10.1016/S1520-765X(01)90118-X. Jump up^ A Voss; M Reinhart; S Sankarappa; H Sprecher (October 1991). “The metabolism of 7,10,13,16,19-docosapentaenoic acid to 4,7,10,13,16,19-docosahexaenoic acid in rat liver is independent of a 4-desaturase”. The Journal of Biological Chemistry. 266 (30): 19995–20000. PMID 1834642. Retrieved January 2, 2011. Jump up^ “Biosynthesis of docosahexaenoic acid (DHA, 22:6-4, 7,10,13,16,19): two distinct pathways”. Prostaglandins, Leukotrienes and Essential Fatty Acids. 68 (2): 181–186. 2003-02-01. doi:10.1016/S0952-3278(02)00268-5. ISSN 0952-3278. Jump up^ Kuda, Ondrej (2017). “Bioactive metabolites of docosahexaenoic acid”. Biochimie. 136: 12–20. doi:10.1016/j.biochi.2017.01.002. Retrieved 31 January 2017. Jump up^ Westphal C, Konkel A, Schunck WH (Nov 2011). “CYP-eicosanoids–a new link between omega-3 fatty acids and cardiac disease?”. Prostaglandins & Other Lipid Mediators. 96 (1–4): 99–108. doi:10.1016/j.prostaglandins.2011.09.001. PMID 21945326. Jump up^ Quinn JF, Raman R, Thomas RG, et al. (November 2010). “Docosahexaenoic acid supplementation and cognitive decline in Alzheimer disease: a randomized trial”. JAMA. 304 (17): 1903–11. doi:10.1001/jama.2010.1510. PMC 3259852  . PMID 21045096. Jump up^ Yurko-Mauro, K; McCarthy, D; Rom, D; Nelson, E. B.; Ryan, A. S.; Blackwell, A; Salem Jr, N; Stedman, M; Midas, Investigators (2010). 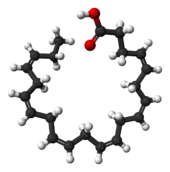 “Beneficial effects of docosahexaenoic acid on cognition in age-related cognitive decline”. Alzheimer’s & Dementia. 6 (6): 456–64. doi:10.1016/j.jalz.2010.01.013. PMID 20434961. Jump up^ Matthew, Muldoon; Christopher M. Ryan; Lei Sheu; Jeffrey K. Yao; Sarah M. Conklin; Stephen B. Manuck (2010). “Serum Phospholipid Docosahexaenonic Acid Is Associated with Cognitive Functioning during Middle Adulthood”. Journal of Nutrition. 140 (4): 848–53. doi:10.3945/jn.109.119578. PMC 2838625  . PMID 20181791. Jump up^ Makrides M, Gibson RA, McPhee AJ, Yelland L, Quinlivan J, Ryan P (2010). “Effect of DHA supplementation during pregnancy on maternal depression and neurodevelopment of young children: a randomized controlled trial”. JAMA. 304 (15): 1675–83. doi:10.1001/jama.2010.1507. PMID 20959577. Jump up^ Rayapudi S, Schwartz SG, Wang X, Chavis P (2013). “Vitamin A and fish oils for retinitis pigmentosa”. Cochrane Database Syst Rev. 12 (12): CD008428. doi:10.1002/14651858.CD008428.pub2. PMC 4259575  . PMID 24357340. Jump up^ Ganança, L; Galfalvy, HC; Oquendo, MA; Hezghia, A; Cooper, TB; Mann, JJ; Sublette, ME. “Lipid correlates of antidepressant response to omega-3 polyunsaturated fatty acid supplementation: A pilot study”. Prostaglandins Leukot Essent Fatty Acids. 119: 38–44. doi:10.1016/j.plefa.2017.03.004. PMID 28410668. Jump up^ Harvard School Of Public Health. “Omega-3 Fatty Acids: An Essential Contribution”. Retrieved 12 June 2015. Jump up^ Denomme J, Stark KD, Holub BJ (2005). “Directly quantitated dietary (n-3) fatty acid intakes of pregnant Canadian women are lower than current dietary recommendations”. The Journal of Nutrition. 135 (2): 206–11. PMID 15671214. Jump up^ Gould, Jacqueline F.; Treyvaud, Karli; Yelland, Lisa N.; Anderson, Peter J.; Smithers, Lisa G.; McPhee, Andrew J.; Makrides, Maria (2017-03-21). “Seven-Year Follow-up of Children Born to Women in a Randomized Trial of Prenatal DHA Supplementation”. JAMA. 317(11): 1173. doi:10.1001/jama.2016.21303. ISSN 0098-7484. Jump up^ Kelley, DS (Mar 2009). “DHA supplementation decreases serum C-reactive protein and other markers of inflammation in hypertriglyceridemic men”. J Nutr. 139 (3): 495–501. doi:10.3945/jn.108.100354. PMC 2646223  . PMID 19158225. ^ Jump up to:a b “EPA and DHA Content of Fish Species. Appendix G2”. US Department of Agriculture. 2005. Retrieved 15 September 2013. Jump up^ “Beef, variety meats and by-products, brain, cooked, simmered”. Retrieved 2011-10-27. Jump up^ Jones, John. “Nutritional Products from Space Research”. May 1st, 2001. NASA. Jump up^ “FDA: Why is there interest in adding DHA and ARA to infant formulas?”. US Food & Drug Administration. Retrieved 1 July 2002. Jump up^ “FDA Announces Qualified Health Claims for Omega-3 Fatty Acids”. US Food & Drug Administration. Jump up^ Rivlin, Gary (2007-01-14). “Magical or Overrated? A Food Additive in a Swirl”. The New York Times. Retrieved 2007-01-15. ^ Jump up to:a b Sanders, T. A. (2009). “DHA status of vegetarians”. Prostaglandins, Leukotrienes and Essential Fatty Acids. 81 (2–3): 137–41. doi:10.1016/j.plefa.2009.05.013. PMID 19500961. Jump up^ Lane, K; Derbyshire, E; Li, W; Brennan, C (2014). “Bioavailability and potential uses of vegetarian sources of omega-3 fatty acids: A review of the literature”. Critical Reviews in Food Science and Nutrition. 54 (5): 572–9. doi:10.1080/10408398.2011.596292. PMID 24261532. Jump up^ Benjamin B Albert (21 January 2015). “Fish oil supplements in New Zealand are highly oxidised and do not meet label content of n-3 PUFA release”. Scientific Reports. 5: 7928. doi:10.1038/srep07928. Jump up^ Albert, Benjamin B.; Cameron-Smith, David; Hofman, Paul L.; Cutfield, Wayne S. (2013). “Oxidation of Marine Omega-3 Supplements and Human Health”. BioMed Research International. 2013: 1–8. doi:10.1155/2013/464921. PMC 3657456  . PMID 23738326. Jump up^ Crawford, M; et al. (2000). “Evidence for the unique function of docosahexaenoic acid (DHA) during the evolution of the modern hominid brain”. Lipids. 34 (S1): S39–S47. doi:10.1007/BF02562227. PMID 10419087. Jump up^ Carlson BA, Kingston JD (2007). “Docosahexaenoic acid biosynthesis and dietary contingency: Encephalization without aquatic constraint”. Am. J. Hum. Biol. 19 (4): 585–8. doi:10.1002/ajhb.20683. PMID 17546613. DHA / EPA Omega-3 Institute – Recent studies, overviews, and objective science.